1 lb. of flour, 1 lb. of sugar, 1 ¼ lb. of Butter beat to a cream, 1 lb. of eggs beaten very light, nutmeg or mace and a wine glass of French Brandy. & the flour to be stirred in, the last & sifted. 2. 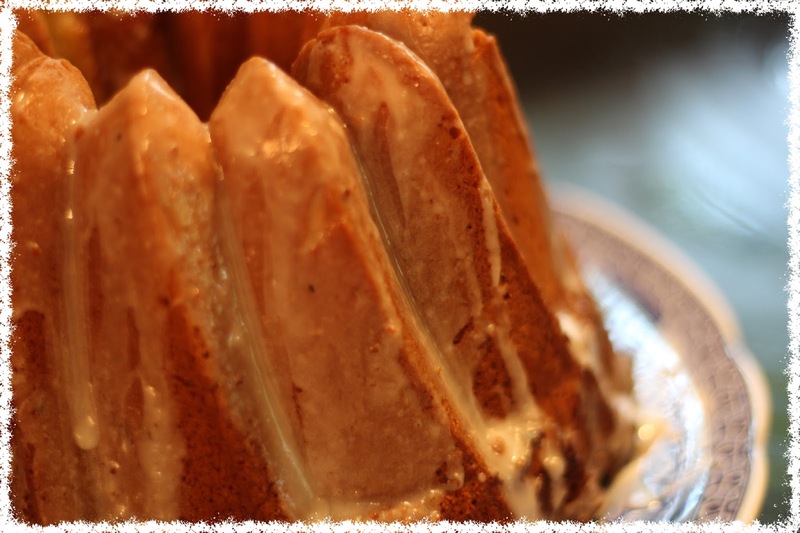 Grease a 12 cup capacity tube/Bundt cake pan. The tube in the center facilitates even cooking, but you can use a regular cake pan. 3. In a medium-sized mixing bowl, whisk together the flour and spices. Set aside. 4. In a large mixing bowl, use an electric mixer to blend the butter and sugar together. Add the egg yolks and brandy and beat until well-blended. 5. Place the egg whites in a large bowl and whisk until very fluffy to the point where soft peaks form. 6. Add the egg whites and flour alternately to the butter/sugar mixture and mix until everything is well-incorporated. 7. Pour into the prepared cake pan and bake about 60 minutes, or until a knife inserted in center comes out clean. 8. Let cool for just a few minutes and then remove from the pan immediately. 9. Top with the recipe for icing, also from the Morris manuscript, at the bottom of this page. For a large one, beat & sift eight oz.’s of best loaf sugar, put in a mortar with four spoonfuls of Rose Water & the whites of two eggs beaten & strained whisk it well, & when the cake is almost cold, dip a feather in the icing & cover the cake well; set it in the oven to harden, but do not let it stay to discolour. The flavoring for this icing is rosewater. Rosewater has been made by steeping the petals in water, oil or alcohol since the days of the ancient Egyptians, Greeks, and Romans. The process of distilling rosewater evolved in the 3rd-4th centuries AD in Mesopatamia. Persia became a rosewater distillation center by the 9th century, and the fragrant essence made its way to Europe in the 11th century with the crusaders, and subsequently became very popular in Medieval English cookery. 1. Place all ingredients in a mixing bowl and beat with an electric mixer until smooth and creamy. 2. Pour or drizzle over cake. Allow the icing to dry and set.